Gabriel Dubreuil is a classical, jazz and folk violinist from North Vancouver. 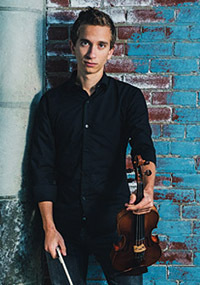 He graduated from Berklee College of Music in 2016, and has since established a name as a violin teacher in Vancouver, and on the Sunshine Coast. Gabriel also directs the Bad to the Bow fiddle group based in Gibsons. He is best recognized for his Celtic-swing group, the Gabriel Dubreuil Trio and the folk rock band, Early Spirit. Besides teaching and performing, Gabriel has worked as a session musician in both Vancouver and Boston for the past five years. He has played on pop, jazz and rock albums, including music videos with local and international bands. Gabriel's second album will be released in late 2018, as well as Early Spirit's debut. CONCERT: Friday, February 9th at 8pm. Go here to learn more and order tickets. Born in Canada to a Chilean father and a Canadian mother, Kalissa grew up in a multi-cultural home where traditional South American music and Cape Breton fiddle music was heard on the stereo. She has dedicated her life to playing, honouring and preserving the fiddle tradition. That tradition includes several styles such as Irish, old-time Canadian, Cape Breton, French Canadian, Texas Swing, Celtic, Metis, bluegrass, country, Son Huasteco and Son Jarocho. By age 12, she made musical history when she was the youngest person ever to win the title of BC Provincial Fiddle Champion. She is a four time Top Ten finalist at the Canadian Grand Masters Fiddle Competition, and her recent work has been nominated for an Independent Music Award and a Western Canada Music Award. Her fiddling mentors have included Oliver Schroer, Jerry Holland, Calvin Vollrath, Gordon Stobbe, Daniel Lapp, and John Arcand. Kalissa has also participated and performed in masterclasses by Mark O’Connor, Natalie MacMaster, Buddy MacMaster, Alasdair Fraser, Ian Fraser and April Verch. 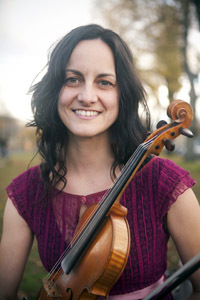 She has also been a guest teacher at several fiddle camps across Canada, as well as the BC Fiddle Orchestra (House of Music) and has taught at The Royal Conservatory of Music in Victoria. Kalissa will be performing with Locarno. In Kalissa’s workshop students will learn tunes picked from her years of travel throughout Canada, the USA, the UK, and Mexico. The workshop will emphasize bowing techniques, phrasing, and ornamentation. The workshop will be geared towards intermediate level players, although all levels are welcome. Students are encouraged to bring a recording device. CONCERT: Sunday, February 11th at 9:15pm. After a UK tour with Spirit of the West in 1989 where he was asked to play some tunes from his ’neck of the woods’ but came up empty handed, fiddler Daniel Lapp, returned to his roots to start digging up original, indigenous BC tunes. He grew up in Prince George which was arguably the hot bed of western Canadian fiddling with a plethora of amazing fiddlers who had moved from the prairies in the 1950’s to the small interior BC town that was experiencing a booming loggings industry. These fiddlers were well organized and passionate about the art form and created the BC Old-Time Fiddle Assocation in 1969. Daniel’s mother, a local school teacher had grown up playing the piano for old-time prairie fiddle dances and so became entrenched in the Prince George fiddling community. With this influence at home (along with a fiddling/farming grandfather and 5 fiddling uncles) Daniel because a young sidekick to many of the PG fiddlers and learned the Canadian art from from them. Upon his return from the UK tour in 1989 Daniel began asking his mentors about ‘original’ tunes - not the standard repertoire of Don Messer and Grand Ole Opry fiddlers who’s tunes dominated the repertoire which Daniel had learned at a young age. Daniel’s collection is now well over 1000 tunes by over 100 BC fiddlers with the newest generation of BC tunes slowly being gathered also. The first performance of these tunes was at the International Meeting of Fiddlers in Cork, Ireland in 1991 where Daniel was invited to showcase. 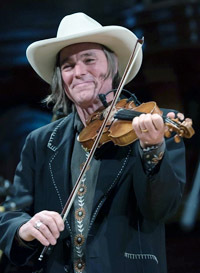 Daniel hopes to build a website in the next year at www.bcfiddlemusic.com to start sharing the tunes with the public. Daniel will accompanied by multi-instrumentalist Adam Dobres for his concert. Adam has shared a very special collaboration spanning many years with Daniel, starting in his fiddle orchestra at the age of fifteen and nowadays joining him around the world. They’ve played together in Glasgow at the Celtic Connections Festival, at the Celtic Colors Festival in Cape Breton, and opened for legendary lrish folk band The Chieftains. In his own words, "It will be rockin'!" 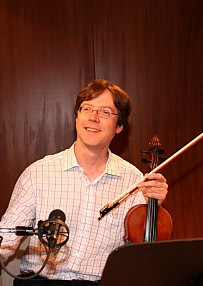 Daniel will be showcasing fiddle tunes of British Columbia in both his performance set and his workshop. The tunes Daniel will teach at his workshop will be drawn from the 1000 original, indigenous BC fiddle compositions that he has collected over the past 30 years. The compositions date back to 1937 and the tunes chosen will represent a historical perspective from 100 years of fiddling from all corners of BC. Please feel free to bring recording devices. CONCERT: Friday, February 9th at 9:15pm. Classically trained at the Vancouver Academy of Music, Kathleen Nisbet has returned to her Métis roo﻿ts, pursuing more traditional fiddle music. Since then she has worked with artists in a variety of genres. A collaborator and regular accompanist with Compaigni v'ni dansi Metis traditional dance, she also has composed music for independant modern dance. Recent theatre credits include A Christmas Carol with Pacific Theatre and Salmon Row with Mortal Coil. Kathleen is an active member of Vancouver's thriving bluegrass and folk scene, performing and touring regularly with her band Viper Central, with whom she has recorded five albums. She has toured with Vancouver artists The Fugitives and CR Avery and has made guest appearances with Hedley, Fred Eaglesmith, The Belle Game, and The Vicious Cycles to name a few. She works regularly as a studio musician and has numerous studio recording credits. She is a teacher at Saint James Music Academy where downtown eastside kids are provided free music lessons. Kathleen also organizes the annual East Van Opry at the Rio Theatre each November. She will be fronting Kathleen Nisbet's Métis Dance Hall at the festival, featuring an all-star lineup of Metis dancers. 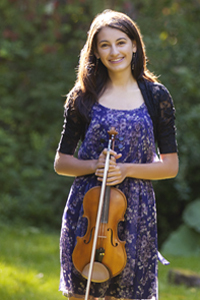 Kathleen will be teaching Metis fiddle music at her workshop for students of all levels. Beginners are more than welcome! CONCERT: Sunday, February 11th at 8pm. 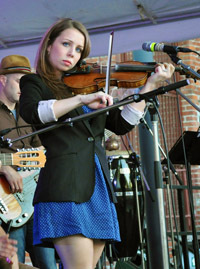 West Coast Canadian touring musician, Jocelyn Pettit is an award-nominated fiddle player, stepdancer, singer and composer. With grace and passion, Jocelyn delivers an exciting and uplifting performance of original and traditional music, inspired by the Celtic and folk music of Canada, Scotland, Ireland, France, Spain, and Scandinavia. With her band, she has ignited stages across Canada, and in the U.S., the U.K., and Europe. She has performed on national television and radio, and shared the stage with world-renowned artists, The Chieftains (Ireland), and Carlos Núñez (Spain). Her debut album received multiple award nominations, and her latest album, Caravan, was nominated for "World Artist of the Year" at the 2017 Western Canadian Music Awards, and at the 2016 Canadian Folk Music Awards. Freshly back from Québec and Scotland, Jocelyn will be sharing some lively tunes and music ideas from her exploring and travels. In the workshop you will learn to play a few tunes by ear, then discuss and apply some stylistic bowing and ornamentation techniques. This workshop is best suited to intermediate/advanced fiddle players and violinists, however all are welcome to come and enjoy. Please feel free to bring recording devices and any questions, as the class will be tailored to suit your needs and requests. Tune sheets will be available after the workshop. CONCERT: Saturday, February 10th at 8pm. Cameron Wilson is an artist whose works showcase the many genres of music he has become associated with both as a composer and performer. He is primarily known as an arranger and composer of both musical parody and criss-crossing musical genres. In recent times, Cameron Wilson’s original works have been highlighted and a more serious side of the composer is emerging. His works have been performed by the CBC Radio Orchestra, the Vancouver Bach Choir, the Vancouver Cantata Singers, Art of Time Ensemble, Symphony Nova Scotia, the Louisiana Philharmonic, Victoria Symphony, Vancouver Symphony, and the Charlotte Symphony Orchestras, the Firebird Ensemble and various ensembles and soloists across North America including violinists James Ehnes and Jonathan Crow. His compositions have been heard on CBC Radio, NPR, BBC and RTE Lyric FM in Ireland. Cameron’s arrangements have been performed by Sarah Slean, Kinnie Starr, Barney Bentall, Nickleback and Steven Page but to mention a few. He has written music for ﬁlms including “Singing the Bones”, "Sikat", "The Mary Contest" and the NFB documentary film "Citizen Sam". The music was nominated for a 2007 Leo Award for Best Music in a Documentary Film. As a violinist/ﬁddler, Cameron has appeared on the recordings of Bryan Adams, Denzel Sinclaire, Nickleback, Charlotte Diamond, Jeremy Fisher, Karin Plato, Spirit of the West and Rafﬁ. Cameron is equally at home in the Celtic, jazz and classical worlds. His workshop will be concentrating on Gypsy jazz. He will be appearing in concert with the Celtic folk group Mad Pudding. Cam's workshop will be divided into two parts. In the first part you will learn a gypsy jazz tune by Django Reinhardt and Stephane Grappelli and discuss/demonstrate technical aspects of playing this style on the violin while learning basic improvisation. In part two there will be discussion the role of the violin in a band, be it Celtic, gypsy jazz, country or folk, with emphasis placed on the importance of the violin as a rhythmic instrument in a band. Cam will be teaching various rhythmic accompanying techniques that he uses in Mad Pudding and Van Django. If there is time, there will be a brief question period at the end. CONCERT: Saturday, February 10th at 9:15pm. 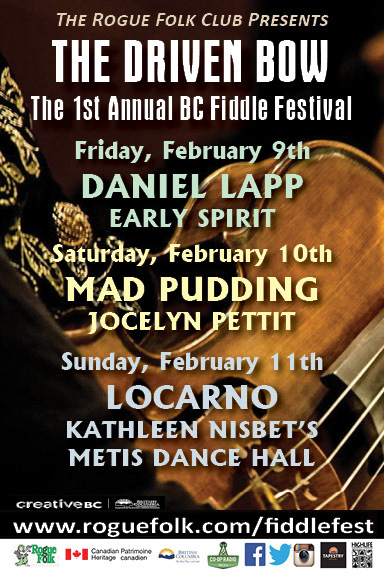 The First Annual BC Fiddle Festival is made possible with assistance from the BC Music Fund.